Langhorne Carpet Company passed the Vertical Flammability Test administered by Aeroblaze Laboratory from Fort Worth Texas. 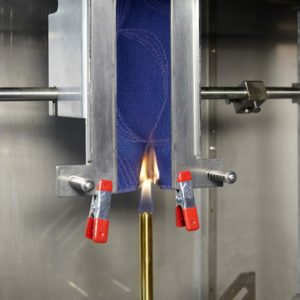 The test is used to determine the resistance of airplane cabin and cargo compartment materials to a flame, and to show compliance with Federal Aviation Regulations (FARs). Wool has natural fire safety attributes and is flame resistant, so wool carpet is recommended for installations with the most rigorous flammability requirements such as passenger aircraft. The flammability of carpets is important in determining the flammability of an entire commercial building or a residential home as well. Fire safety includes the amount of smoke and toxic gas produced during a fire, as well as how fast flames can spread. Wool outperforms all other commonly installed textile fibers. Wool is also self-extinguishing once the source of the fire is removed. Homes and buildings are safer during a fire if the carpet is more flame resistant. Langhorne Carpet is made from the highest quality wool from either New Zealand or the United Kingdom. Our wool buyers know that every yard we acquire must be the best available. There is simply no finer wool in the world, and even the best synthetic imitation cannot compare to our carpet when it comes to color, clarity, texture, feel, fit and finish.